Not to be confused with Hammer Slammer. 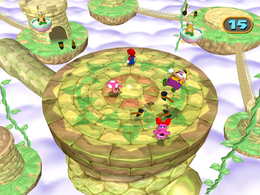 Hammer Spammer is an 8-Player minigame in Mario Party 7. The camera shows the hammer-shaped platform, and zooms to the view used during the game. The Hammer Bros., on platforms, then float into place. The eight players are attempting to dodge the hammers thrown by the Hammer Bros. Whoever is hit by a hammer is eliminated. Every once in a while, two giant hammers crash down on the stage, squishing and eliminating any players caught under them. Those who survive the barrage for 30 seconds win for their team. Rules – "Survive the barrage of the Hammer Bros.!" Advice – "Watch the shadow of the hammers so you know where they will land." This page was last edited on August 7, 2018, at 01:02.